The Bai people hold the colour white in high esteem and the term “Baizu” (白族) actually translates to mean “white people”. That being said, the Bai aren’t racist! They just have a preference for white clothes. 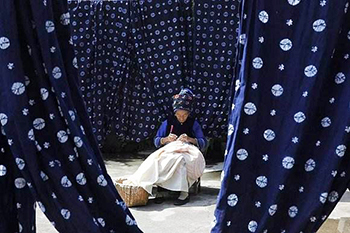 The majority of their nearly 2-million-strong population can be found in Yunnan province, with smaller constituencies in Guizhou, Sichuan, and Hunan. They can be further separated into three ethnic subgroups; the Minjia, who represent 95% of the total population; the Nama, who account for just 3.5%; and the Lemo, who make up the last 1.5%. 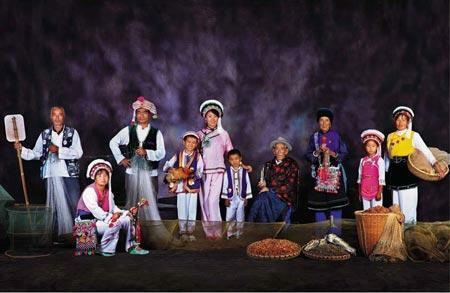 While the Minjia people predominantly live in the region near Erhai Lake, the Nama people can be found near the Lancang River, and the Lemo people inhabit areas near the Nujiang River. The complexity of their culture is matched only by that of their history! Archaeologists have found evidence in the Erhai region that suggests it was inhabited as early as the Neolithic Era (c. 10,200-2,000 BC). Their findings indicate that these ancient people had already invented stone tools and engaged in farming, livestock rearing, fishing, and hunting. Other evidence, such as bronze knives and swords, imply that they began using metal tools approximately 2,000 years ago. Yet no one, not even the Bai people themselves, is absolutely sure whether these early settlers are their ancestors! 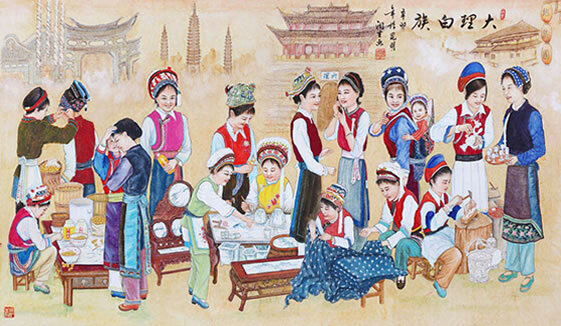 During the Qin (221-206 BC) and Han (206 BC–220 AD) dynasties, it is believed that locals in the Erhai area developed close ties with the Han ethnic group. In 109 BC, the imperial government sent large numbers of Han people there, who brought with them advanced techniques and tools. The Bai language, which borrows many words from Chinese, also supports the theory that they interacted with the Han people from an early stage. However, it wasn’t until the Tang Dynasty (618-907) that the Bai’s history began to be formally documented. Supported by the Tang Court, a group of Bai and Yi aristocrats unified the ethnic groups in the Erhai area and established the Nanzhao Kingdom (738-902), which was ruled by a man known as Piluoge. Throughout its reign this kingdom was the most powerful political entity in southern China and successfully established alliances with both the Chinese and Tibetans. It was not only an important trade centre, linking China to commercial routes in Southeast Asia, but was also a religious centre where Buddhism flourished. At one point, this burgeoning empire was so large that it controlled parts of Vietnam, Burma, and Laos! However it oppressed many of the local ethnic groups, plundered their resources, and forced numerous people into slavery. The kingdom was overthrown with such violence that it took 35 years of chaos and revolt before the region finally recovered and Duan Siping was able to establish the Dali Kingdom (937-1253). This kingdom was predominantly made up of Bai people and retained many of the political, cultural, and religious characteristics of its predecessor, but abolished exorbitant taxes and treated its citizens far more fairly. Since it was a valued commercial partner of the Song Dynasty (960-1279), its people enjoyed a period of peace and productivity. Unfortunately this tranquillity was not to last, as the Mongols annexed the Dali Kingdom during their eventual establishment of the Yuan Dynasty (1271-1368) and demoted the Duan royal family from leaders to Tusi. During the Ming Dynasty (1368-1644), the Duan were removed and replaced with imperial officials. This is where their history begins to get rather hazy, as it seems many Bai people decided to take matters into their own hands! In Bai culture, they have a complex clan system that has depended upon the use and systemisation of surnames since the Nanzhao Kingdom. This means that most clans will have a family temple where they keep extensive lineage records detailing their ancestors’ histories and accomplishments. Before the 13th century, most of these family records would place emphasis on the fact that their ancestors were officials for the Nanzhao or Dali Kingdoms. However, during the Ming Dynasty many of these records were changed to “prove” that their ancestors had originated from Nanjing and were related to the Han ethnic group. Many scholars believe that this was designed to curry favour with the ruling Han imperials and help Bai aristocrats gain official positions. The Bai people thus foster a belief in dual ancestral origins; on the one hand, they believe that their forefathers were high-ranking officials in the Nanzhao and Dali Kingdoms; on the other hand, they allege that their ancestors were Han people who came from Nanjing as part of the Ming army. In short, don’t ask a Bai person about their family history unless you have a lot of time on your hands! Historically the Bai are an industrious and well-educated people, having made great advances in meteorology, astronomy, architecture, medical science, literature, and art. Perhaps their most famous achievements are the magnificent Three Pagodas, which stand just outside Dali Ancient Town. Like many ethnic minorities, the Bai people have great reverence for their elders. Traditionally youths should greet elders warmly and offer them their seat, a cup of tea, and a cigarette. It’s considered incredibly disrespectful to cross your legs or use foul language in front of an elderly person. In a Bai household, the first cup of morning tea is always offered to the oldest relative and during meals they will always sit at the head of the table and start eating first. Many of these elders will be heads of their family temple. The Bai predominantly follow a surname-based clan system and so family temples are very common, particularly in the Erhai region. In Xizhou alone, there are temples belonging to the Yang, Yin, Dong, Zhang, and Yue families. When an elderly member of the family is appointed as head of the temple, they have the power to resolve disputes and make important decisions within the family. It is their responsibility to discipline and educate younger relatives, as well as oversee affairs such as the buying and selling of land. The Bai people are also extremely superstitious and adhere to a number of taboos. Fireplaces are considered sacred and so it is forbidden to spit on or step over them; people who are mourning a death are not allowed to enter the homes of others; on New Year’s Eve, people should return anything they have borrowed and retrieve any items they have lent out, otherwise they will have bad luck and a poor harvest in the coming year; and on New Year’s Day, people must not use a knife, carry water into their home, or sweep the floor.